In the course of Shakespeare’s early tragedy, Titus Andronicus, Titus’s daughter Lavinia is rendered mute: her tongue is cut out and, as if this were insufficient, her hands too are hewn off. Despite these evident impediments to communicative performance, Lavinia’s gestural eloquence is the subject of comment and admiration by other characters. When faced with his brutally muted and mutilated daughter’s exquisitely tormenting sighs, winks, nods and kneelings, Titus commits himself to learning the meaning of her signs, to ‘wrest[ing] an alphabet’ from the silent gestures whose significance is initially, and frustratingly, lost on him. Titus’s urgent desire to draw meaning from Lavinia’s elliptical and codified performance is matched by his recognition that it may not yield up its secrets without study on his part. His words are considerably affecting on both counts. They also bear usefully on subsequent wordless performances whose specific import may not be immediately self-explanatory. In terms directly borrowed from Titus, therefore, the project of this book is, similarly, to seek to ‘wrest an alphabet’ from silent Shakespeare films and the performances they contain, to tease out their mysteries and to lay their eloquence before the reader. Shakespearean sources were made by the British, American, French, Italian, German and Danish film industries.2 As is the case for so many films from the silent era, however, large quantities of them have since gone missing, or been destroyed, or have disintegrated beyond the point of possible restoration. The cellulose-nitrate stock onto which all films before the 1950s were shot makes them liable to combust spontaneously or, like all polymers, simply to decompose irrevocably. Nitrate film is equally vulnerable to damage from moisture in the atmosphere as it is to slight increases in temperature. The arrival of the sound era in the late 1920s quickly despatched silent film to the status of ‘yesterday’s thing’ and, as a result, the cans containing gently crumbling or spontaneously combusting prints of silent films were not a mainstream archiving priority for some time.3 As a result of a combination of neglect, loss, disintegration and wilful destruction, of the three hundred silent Shakespeare films originally made, only approximately forty now survive. ‘Biograph Girl’), Charles Kent, Maurice Costello, Francesca Bertini, Frank Benson, Frederick Warde, Johnston Forbes-Robertson, Francis X. Bushman, Theda Bara, Ruggero Ruggeri, Asta Nielsen and Emil Jannings. It includes films which court a high seriousness of tone and films which glory in their own idiocies. The silent Shakespearean filmography is, that is, eclectic in both material and approach. The only previous book-length study to take on this eclectic body of films was written in the late 1960s by the meticulous American scholar Robert Hamilton Ball. Those of us who come after owe a weighty debt to Ball, who made it his labour-intensive business to produce a comprehensive survey of the field as it then appeared.7 Ball’s book distils the findings of more than a decade of entrepreneurial research, makes for delightful as well as densely informative reading and is the invaluable resource in this area. However, the sheer extent of the book’s coverage necessarily prevents Ball from giving sustained attention to any individual film or even cluster of films. My approach is more selective. While alluding to the wider body of other films that form the background to, and useful comparators for, each film under discussion, I select a smaller number for detailed discussion. Some of the films I consider were also known to Ball; others – such as Herbert Beerbohm Tree’s 1899 King John, Thanhouser’s 1910 A Winter’s Tale (all prints of which were believed to have been destroyed by a fire in 1917) and the 1912 Frederick Warde Richard III – have come to light since. Other films simply proved impossible for Ball to locate in the very different research world of forty years ago. Prints of the 1908 Vitagraph Julius Caesar, the 1909 Film d’Arte Italiana Othello (Otello) and the 1909 Cines Macbeth (Macbett), for example, are now archivally catalogued and so possible to trace in ways they were not then. silent Shakespeare films).8 With regards to coverage, this book therefore has a twin objective: first, to develop the debate about films that may well already be known to readers, and second, to bring into critical circulation some films not commercially available and so, as yet, scarcely known, if at all. In the examples I choose, I attempt to keep a balance between these two pools of material. Films I examine which are currently only available in archival prints include releases from early Italian production companies Cines and Film d’Arte Italiana (FAI), from the early American producers Vitagraph and Thanhouser, and three separate films of Hamlet – starring Sir Johnston Forbes-Robertson (1913), Italian classical actor Ruggero Ruggeri (1917) and Danish film star Asta Nielsen (1920). Most of the films discussed are extant, but some are only recoverable through the paper trail of scripts, catalogue descriptions, review and production reports they leave behind. All case-study films (extant or not, commercially available or not) are chosen for their capacity to illustrate with particular clarity, grace or piquancy some of the symptomatic issues raised by silent Shakespeare films as a more extensive body. From a contemporary perspective, silent Shakespeare films seem oxymoronic in conception. The collaboration of this dramatic material with this medium of expression might even be considered a liaison of antithetical forces: one imaginatively evokes the image through the suggestive power of the word, the other does not just erode the power of the word by its privileging of the image, but all but evicts those words from its playing space. As if in acknowledgement of the contradictions inherent in the match, the resulting films themselves often pay homage to multiple masters: stage and screen, word and image, textual fidelity and filmic autonomy, inherited iconographies and vital performance, high culture and popular culture, heritage and topicality, ‘author’ and market, acts of memorialising and acts of making new. They are, therefore, frequently both burdened and enriched by competing agenda. Jorgens’ celebration of the loss of these films makes difficult reading. If a mercy is to be identified in this history, it is surely not, as Jorgens would have it, that most early Shakespeare films are lost, but rather – given the fate of the majority of films of the era – that not quite all of them are. For Jorgens, however, these were shadows whose innate capacity to offend could, it seems, only be ‘mended’ by being razed from the history. For cineastes, therefore, Shakespeare came to epitomise the theatrical burden that was inhibiting the cinema from realising its own potential. Lev Kuleshov spoke for many cinephiles in 1918 when he called upon film-makers to reject the alleged charge of being ‘not literary enough’ and ‘not dramatic’ and to embrace the idea that ‘the cinema’s language [should be] cinematographic!’15 Inherited literary and dramatic values had, in this characteristic articulation, become the inappropriate import that was stifling cinema’s own uninhibited engagements with its own ‘language’. In the face of antagonism from both directions, the position of silent Shakespeare films is not just that of an idiosyncratic curio: it is awkwardly and provocatively liminal – caught between a Shakespearean world and a filmic one and apparently wonderfully well placed to disappoint both. In the chapters that follow, I take account of the weight of criticism the films have attracted from both Shakespearean and cineaste camps. I consider the contradictory charges of textual violation and of stultifying textual reverence. I also, however, attempt to see beyond such limited and limiting readings to the ways in which the films’ divided allegiances can illuminate a range of issues: the aspirations of both theatre and cinema as institutions, the tonal register of performance styles, the status of stars, the priorities of production companies and of national film industries, the history of Shakespearean performance and even, at times, the nature of the plays themselves. It will be part of the project to delineate the lines of tension created by the encounters and contests to which the films play host and to show how expressive the resulting dissonances can be about the inherited material, the medium of adaptation and the complexity of the cultural baggage that attends the union of the two. Emil Jannings 1922 Othello), they have only ever been considered merely bit-part players? 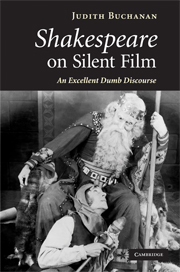 The simple fact of writing a book-length study on silent Shakespeare film might be thought an attempt to draw in this material from the edges of other stories into a more privileged position at the centre of its own. This is not my intention. I am interested in these films partly because of the discrepancy between their prevalence and individual merits on the one hand and the fringe position they occupy in relation to other, more dominant histories on the other. That fringe position, as critically determined, is in itself illuminating about cultural hierarchies and how history privileges some tales, or some modes of telling tales, over others: I would therefore be loath to lose the sense of roguish marginality from the account. It forms a necessary part of the contextualising backdrop to the appeal of the films themselves. The first audiences for silent Shakespeare films certainly did not struggle to find viewing pleasure in them. Indeed, the standard critical response on release was broadly, and often warmly, enthusiastic. There were, of course, those who felt it incumbent upon them to express suspicion about the value of wordless cinematic Shakespeare per se. Even the self-declared sceptics, however, usually confined their cautious comments to their introductory remarks. More often than not, such remarks then served simply as the ground-clearing precursor to making an exception in the case of the particular film currently under discussion. Three film releases of the 1916 tercentenary provide a useful source of examples for this critical tendency. appreciative account of the exceptional virtues of the particular film discussed became, in fact, a recognisable critical response. Although it was accepted as a truism in some quarters that adapting Shakespeare for silent film was misguided (‘It is well known that …’, ‘We have all heard it said that …’), in practice, as first released, these films were far more frequently the cause of pride, admiration and congratulation than of embarrassment or incredulity. Sceptical commentators were comfortably outnumbered by those who declared themselves impressed by the cultural, artistic and commercial potential of the endeavour to bring Shakespeare to the screen for the appreciation of the masses. Individual aspects of the films’ production, marketing, distribution and exhibition practices will be discussed as they become relevant in the pages ahead. However, there is one exhibition convention of the early cinema period – the use of a live lecturer during the projection – that bears so directly upon the idea of what silent Shakespeare films were, and how they were received, that it merits a separate note ahead of time.